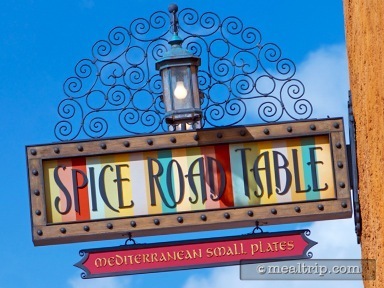 The Spice Road Table is a Moroccan / Mediterranean themed restaurant that offers both indoor and outdoor, covered seating. In the center of the two areas, is a walk-up wine and spirits bar. The location does offer a full-service experience (i.e. you have a waiter or waitress). 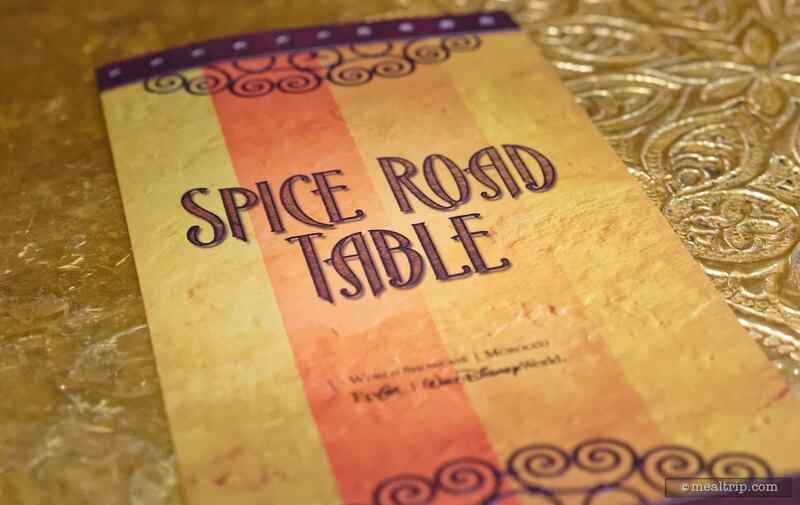 I had not been back to visit the Spice Road Table since the official menu changeover, from small plate tapas style dining — to the more common three-course (appetizer, main entree, dessert) format. I have good memories of the restaurant dating all the way back to the opening day menu. While not being particularly "authentic" Mediterranean — the small plate items did have flavor, cute presentations, and stayed pretty close to an Americanized idea of what Mediterranean food might be. Hummm… I do seem to be using the words "had been" quite a lot. 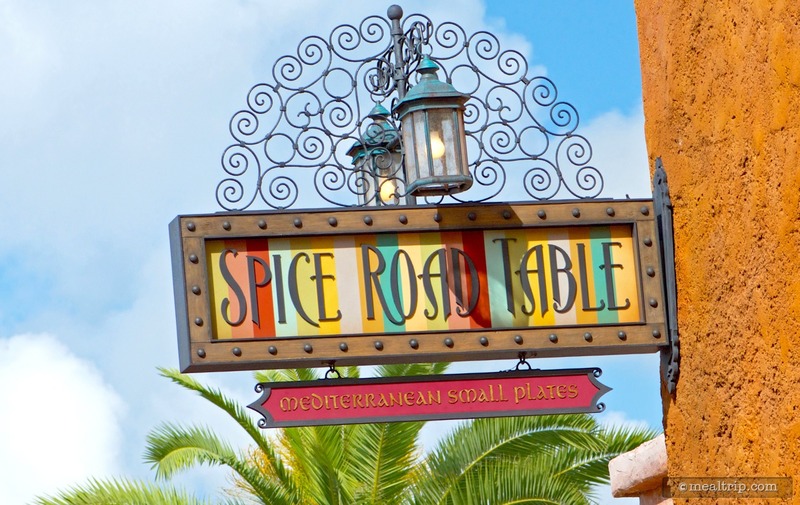 Some of the small plate dishes of years past have survived as "appetizers", and as I'm finding with more and more Disney-based restaurants — the appetizers seem to be where all the flavor and fun is located. 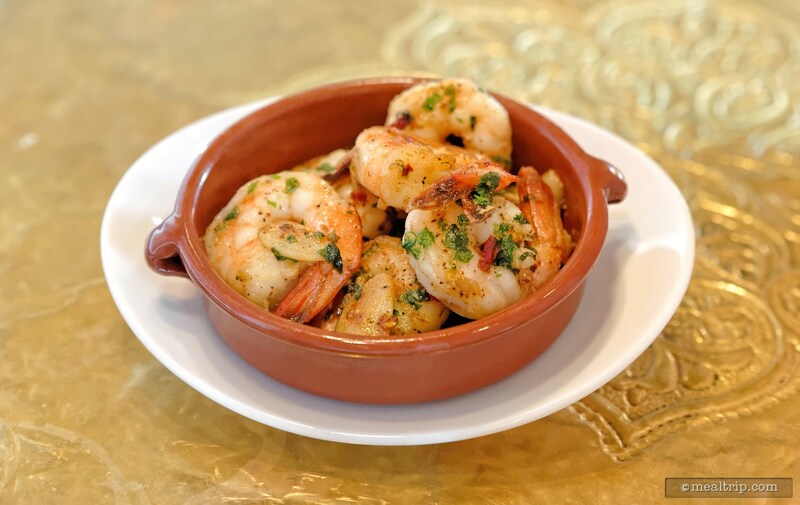 While I have tried a couple items in the past, the Spicy Garlic Shrimp had one of my favorites and I was very curious to see if anything had changed. 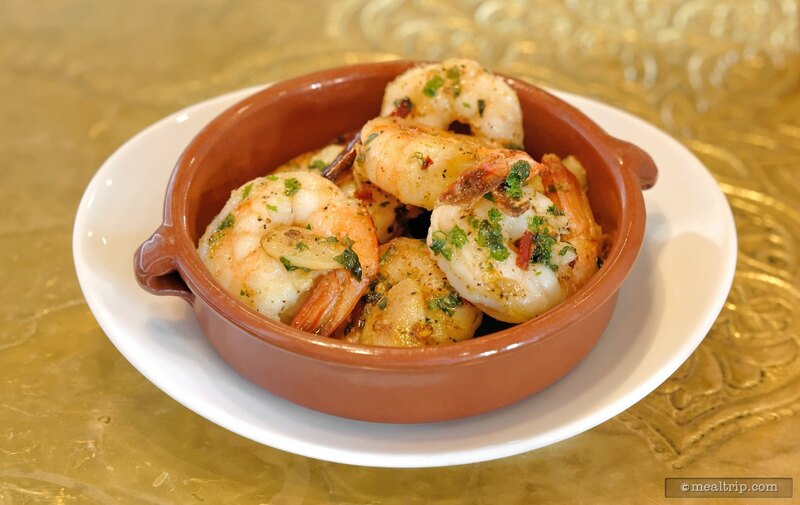 I'm happy to report that the Spicy Garlic Shrimp is still a really great, flavor forward item — but the small portion of bread that had been part of the dish in years past — is no longer included. 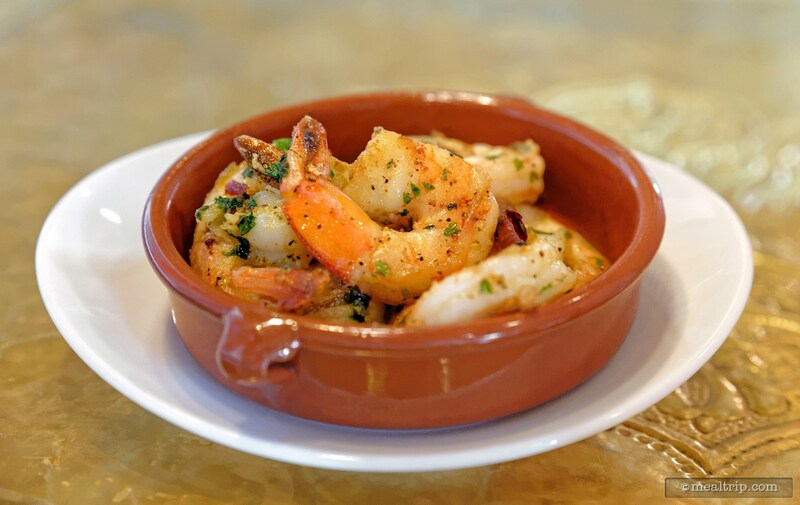 You get seven shrimp (of moderate size) sautéed in a decent olive oil with some dried chilies and fried garlic for $13. 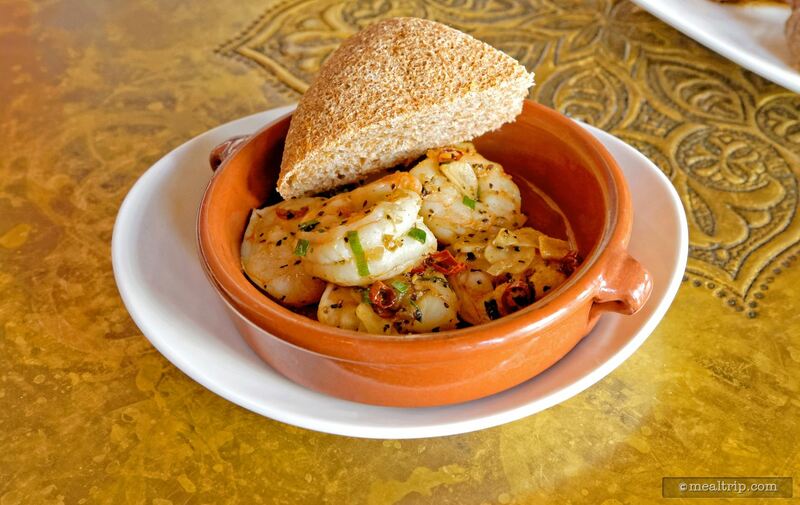 It is a great dish, but with each of those shrimp coming in at $1.85 a piece — that little clunk of bread had been a really nice touch. 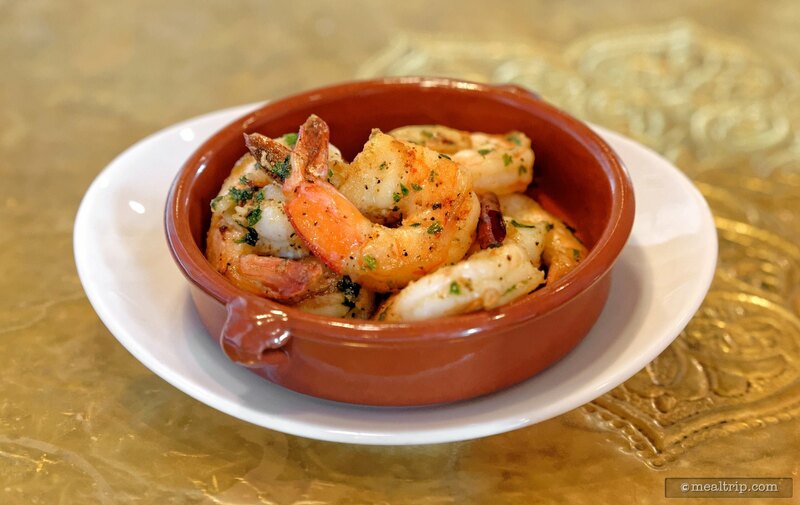 No matter how much you swoosh the shrimp around in that bowl, there's going to be some pretty amazing fried garlic and chili olive oil left over in the dish. Sopping up that savory olive oil with the bread was a great way to finish the dish… and now it's not. 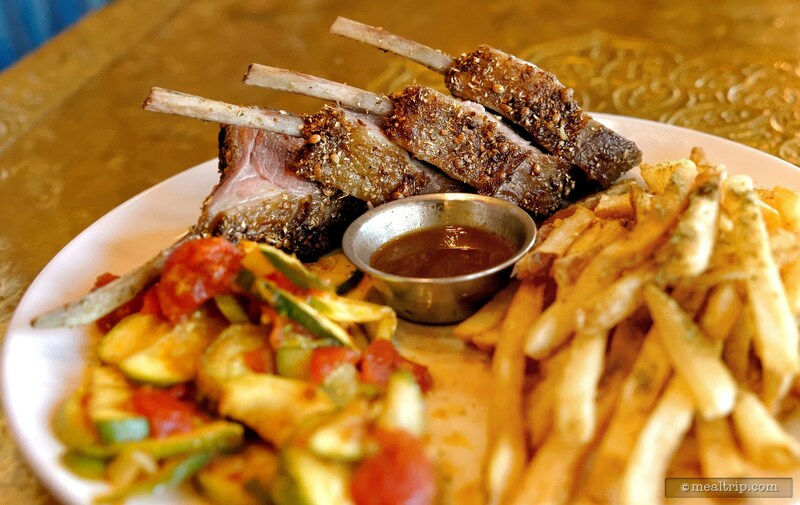 Moving on to the main entree I decided to go with the Coriander Crusted Rack of Lamb, mostly because it seemed like it might be the most "authentic" entree on the menu. Other items included an All-Natural Roasted Chicken and a NY Strip Steak — which didn't seem particularly Mediterranean. 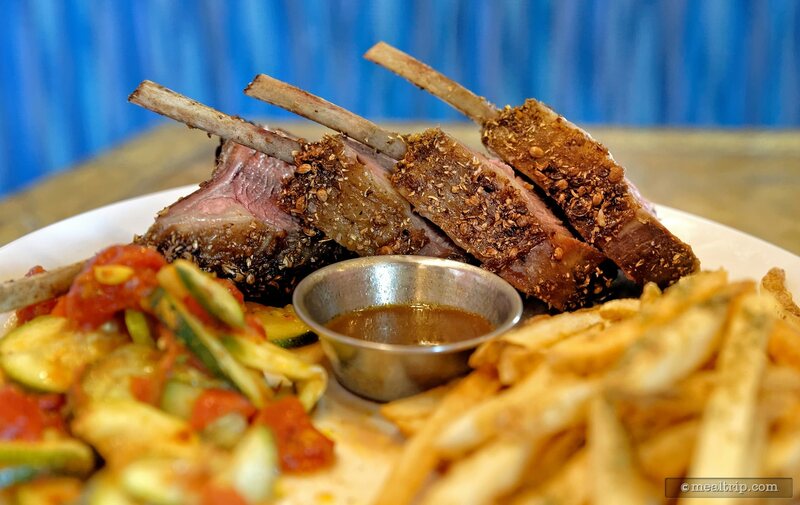 The good news is… there were four perfectly cooked, lean, Frenched lamb rib chops on the plate along with a little cinnamon spiced dish of au jus. It's hard to fault the quality or the cut here. However, they were very, very lightly coriander crusted along with maybe a bit of black pepper and salt (honestly, probably more salt than Coriander… but at the same time, I can't say they were over salted). 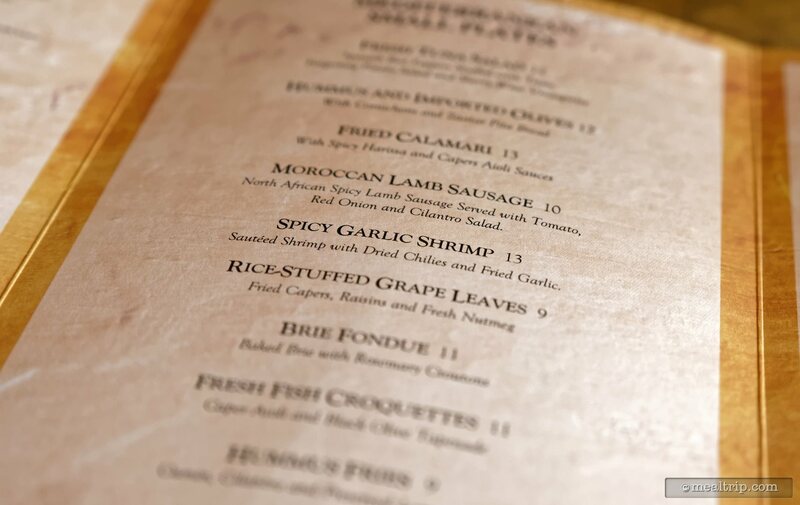 With "spice" being in the name of the restaurant… I was hoping for a little more flavor punch… a "taste of the Mediterranean" if you will. My search for authenticity really seemed to fall apart when diving into the "sides" that were on the plate with this one. 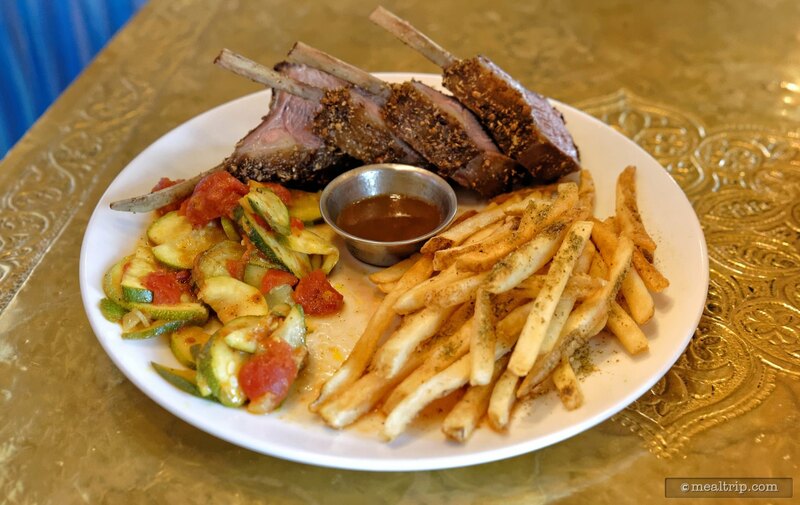 They included "Roasted Tomatoes and Zucchini" which is basically "ratatouille" and "Zaatar Fries" which were "served tepid" (i.e. room temperature) soggy, and dusted with dried thyme, salt, and pepper. 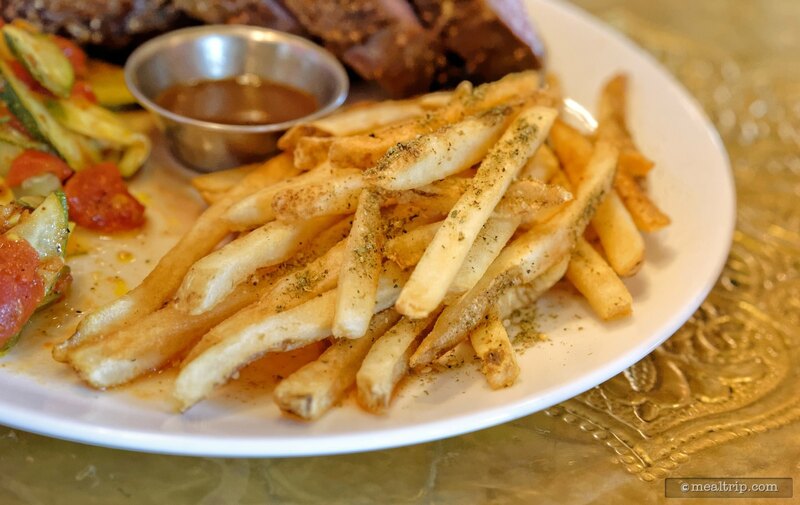 You could at least see the spices on the fries — but there is supposed to be Sumac in a traditional Zaatar blend … if Sumac was on these fries… it was too little to make a difference. I guess my biggest disappointment was the fact that those two sides are basically both things that are kept warm in large quantities in the kitchen and just spooned onto the plate. With an entree that cost $36, I would have rather seen something more unique, made to order, authentic to the region the restaurant represents, or just flavor forward in general. As a side note, I asked my server (who's name tag indicated that he was from Morocco), if this is what he traditionally eats at home. His reply was, that he mostly ate at McDonalds. So there you go. I guess fries are more Moroccan than I thought. For dessert I opted for the "Baklava Sampler" which included three different types of baklava… pistachio, almond, and walnut. The long one was about the size of a single Twix bar and the other two would feel right at home in a chocolate sampler box. As with most mini desserts, you really don't get the feel for what a true, single, large portion of what baklava should be, which is sticky with syrup or honey to the point of almost oozing with it… or at the very least… moist. Most of the moisture on this small sampler plate came from the chocolate sauce drizzled on top. All in all, I can't say the food was "bad" — it just was normalized to the point where you're not really going to get a feel for what Morocan or Mediterranean cuisine should be. 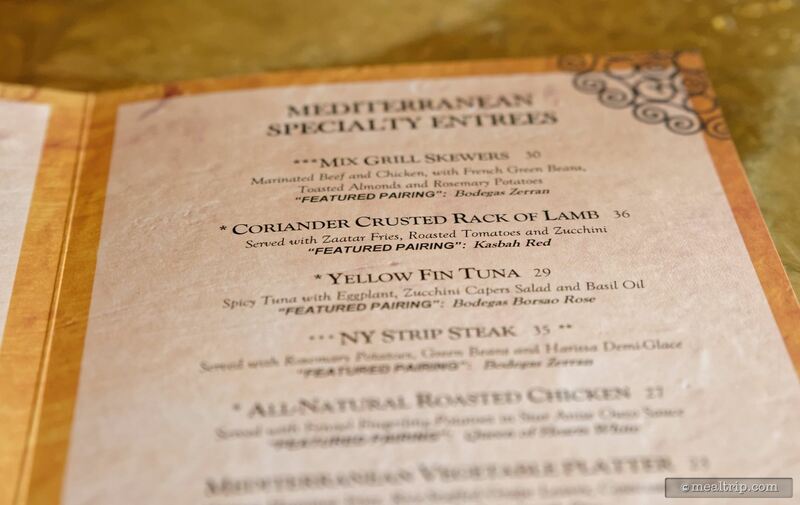 This was… "Mediterranean encouraged" American dining at best. 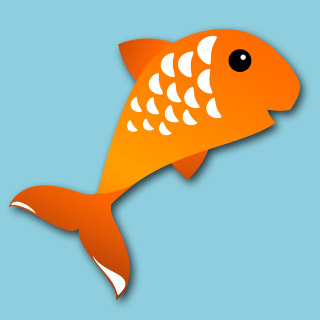 Not bad, but not… what it used to be. My beverage of choice was a soda… total meal cost (minus tax and tip), was $64. 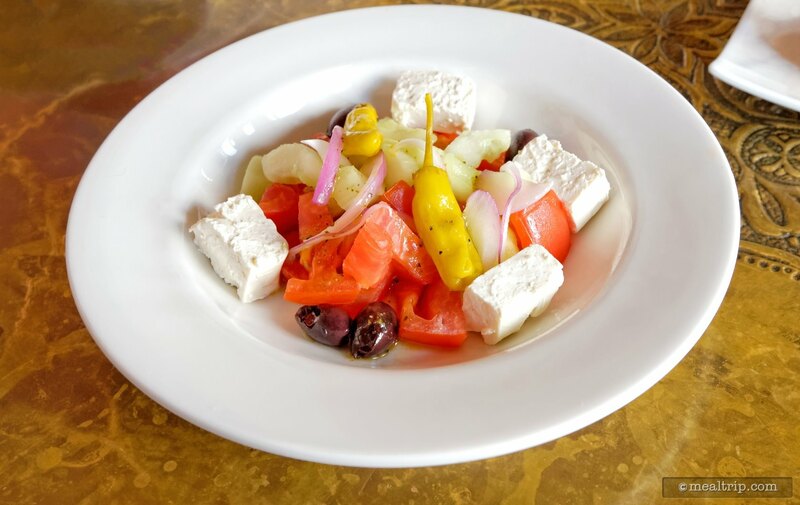 The Greek salad was very fresh. Everything was separated instead of tossed all together. 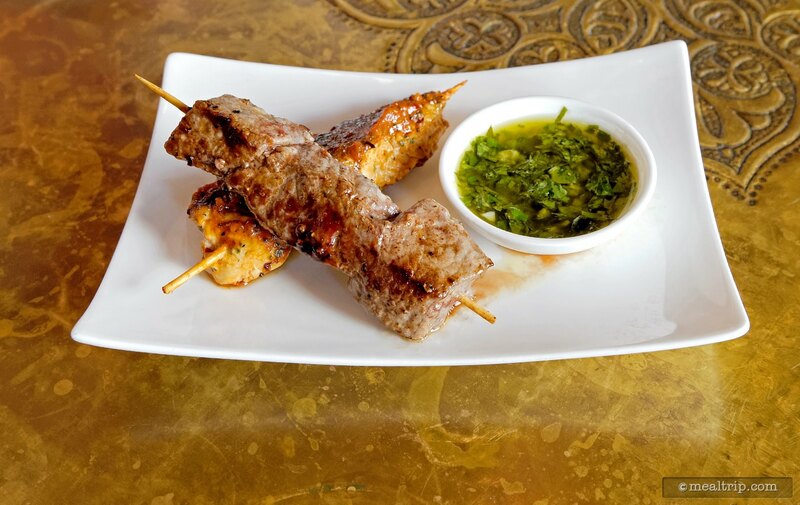 The chicken and beef skewer was tasty. Both meats were cooked fo perfection. CLICK HERE to view all 22 images in our photo gallery.